Your browser does not support the video tag. Ingredients 1 cup (250g) Lactantia® European Style Butter, Unsalted, softened 1 cup (225g) white sugar 1 egg 3 cups (360g) all-purpose flour ½ tsp (3g) salt 1 jar (227mL) cherry jam or jam of your choice 2 cups (220g) of confectioners’ sugar Instructions Preheat the oven to 375° F (190° C). Grease cookie sheets with Lactantia® European Style butter. In a large bowl, cream together Lactantia® European Style butter and sugar until smooth. Beat in the egg. Combine the flour and salt; stir into the creamed mixture. Dough will be stiff. On a lightly floured surface, roll the dough out to 1/8-inch thickness. Using a round cookie cutter, cut 24 cookies. Using a star cookie cutter, cut stars into the center of half of the cookies. Set cookies 1 inch apart onto the prepared cookie sheets. Bake for 5 to 7 minutes in the preheated oven, until golden around the edges. Remove from cookie sheets to cool on wire racks. Once the cookies are cooled, dust the tops with confectioner sugar and place a teaspoon of jam onto each cookie bottom and spread out to cover the cookie. Place cookie tops on jam bottoms to complete your cookies. Preheat the oven to 375° F (190° C). Grease cookie sheets with Lactantia® European Style butter. 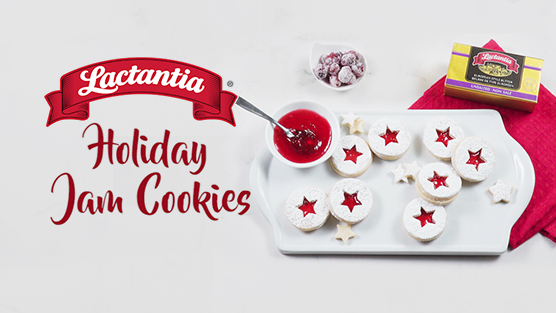 In a large bowl, cream together Lactantia® European Style butter and sugar until smooth. Beat in the egg. Combine the flour and salt; stir into the creamed mixture. Dough will be stiff. On a lightly floured surface, roll the dough out to 1/8-inch thickness. Using a round cookie cutter, cut 24 cookies. Using a star cookie cutter, cut stars into the center of half of the cookies. Set cookies 1 inch apart onto the prepared cookie sheets. Bake for 5 to 7 minutes in the preheated oven, until golden around the edges. Remove from cookie sheets to cool on wire racks. Once the cookies are cooled, dust the tops with confectioner sugar and place a teaspoon of jam onto each cookie bottom and spread out to cover the cookie. Place cookie tops on jam bottoms to complete your cookies.